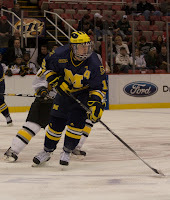 1:18 - Wohlberg gets taken down by VanWagner and we go to a Michigan PP. This should be a decent enough game - wish more people were here to see it. Oh well. I'm here and Karl is at ice level with camera in tow. Pretty swell coverage we got going here, eh? 2:55 UM can't get anything going here. 3:11 Robinson with a good save on a point shot from Summers. This PA is TOO LOUD. Four minutes in and my ears are bleeding. 6:41 Kivisto with a nice hit on Brown along the boards. Finally, something to make some noise about. In an unrelated, yet related, note - USCHO's Bob Miller has done away with the mustache. The PA just yelled some announcement about a tote bag. Now I hear Michigan Tech cow bell. Who brings cow bell any more? 7:59 Now the Tech band is playing the Darth Vader theme. Because that sounds well during a stoppage in play. 9:09 A scramble in front of Robinson, but no goal. No noise, either. 11:46 Hogan smothers an Olson shot for his first big test of the game. 11:50 Kampfer for hooking off the draw. 12:13 Kattelus misses the net on the PP. 13:24 MacLeod for tripping Moffie after Moffie made a save on a shot with Hogan out of position. 15:22 With two ticks left on McLeod's penalty, Sparks nets his first NCAA goal. Great place to get it, too. Rust and Hagelin with the apples. The Hard Lessons have a concert at the intermission. WHO??? 20:00 End of one - 1-0 Michigan, who also lead in shots, 14-7. 2:50 2-0 Wolverines. Lebler announced, but looked like Wohlberg with a tip. It may be changed. No, it should be changed. 6:43 Summers for a trip. I guess. The conversation in the press box has turned to the popcorn. The term "buttery morsels" was tossed around. 7:51 Langlais for high-sticking!!!!!!!!! That's the way the PA dude is announcing it. 8:12 Llewellyn for holding. And "Benny & The Jets" gets air time. WHY??? 9:09 Kampfer for slashing. MTU needs a goal - or three. 10:12 It all starts with one. Olson on a nice cross-ice feed from Cousens. Hogan was WAY out of position. Yet, still no energy in the JLA. I need/want/crave a nap. Or "quiet time" like we say at our house to the kiddos. 12:59 Doriott for holding. Michigan looking for their third PPG. 15:13 The UM band plays "The Final Countdown" even though it's not. 17:18 With Robinson's arse to the play, Rust banks it off of said arse. Just a terrible goal. 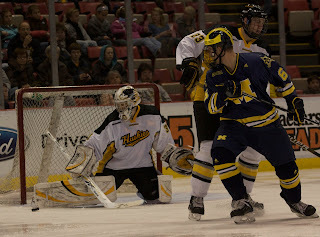 Good thing MTU has both backups dressed. End of two - 3-1 Michigan and shots are 32-14 Michigan. Off to grow a tail now. Not really. Just sounded like a cool thing to write. Not much early, but I'm digging the flat screens in the press box. 1:05 Jimmy Buffett's "Cheeseburger In Paradise" gets play. Again, why??? Good tune, but we only get pizza post-game. Might send someone out for burgers after this game. Karl??? 3:08 Players hanging out around the Michigan net, so Kattelus steps in and gets No. 1 on the season. Now a 3-2 game, folks. 5:38 JLA starting to get loud and filled with fans ... for the Michigan State-RPI game. 6:28 Pietila gets trashed along the boards and skates hunched over to the bench. Didn't see who hit him, though. 9:26 Huge carom off the boards leads to Sparks getting goal No. 2. Robinson looked like a dying carp trying to get in position. Our first playing of a song with the word "Shorty" gets heard with 50 Cent's "In Da Club." Fantastic. 12:22 Baker gets Tech back to within a goal by finishing off a 2-on-1 break with Dobson. Just blew it by Hogan, who looks bored out there. Until he stops Kattelus from point-blank range at 12:45. Pizza has arrived in the press box. Good, I'm starving. The popcorn just wasn't cutting it. 18:58 Hogan's poke-check almost winds up behind him. MTU calls time-out. Robinson stays on the bench. 19:48 Lebler with the ENG with Sparks wide-open. Lebler realized it, too.